BlackBerry Thunder pic leaked | BlackBerry Blast! The Boy Genius has done it again. BGR has leaked an exclusive picture of a touchscreen BlackBerry. The BlackBerry Thunder, which BGR says is a dual mode (EV-DO Rev. 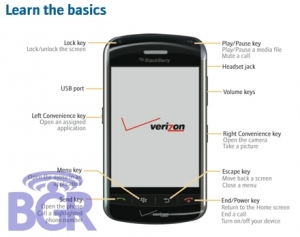 C and GSM HSPA) touchscreen BlackBerry will debut on Verizon in the 3rd quarter of 2008. Will a touchscreen BlackBerry really catch on? It seems to me BlackBerry's strength is in its tactile keyboard but we'll see. Stay tuned.